Rushing the first wool clip of the season from Geelong to the early London wool sales, the Loch Leven was only two days into her journey when disaster struck. 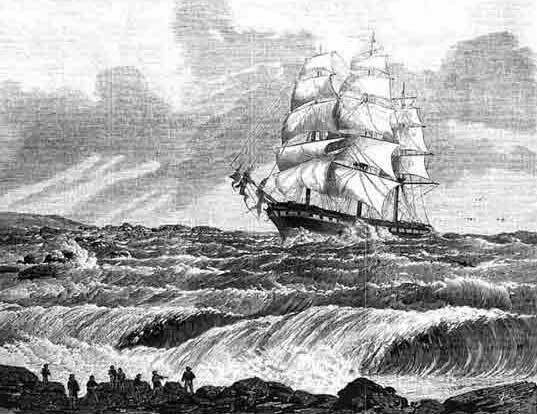 In heavy fog and boisterous seas, she was caught by the heavy current that rounds the northern tip of King Island and struck the rocks at 2.30 a.m. on 24th October, 1871. Daylight presented what must have been the unforgettable sight of a clipper ship under full sail, high and dry on the reef. As there was nothing they could do to move her, the 33 crew and 10 passengers left the ship in the boats and headed for Cape Wickham. Later the captain decided to return to the wreck for his instruments and the ship’s papers, but on the return trip the boat overturned and Branscombe, who was believed to have been hit on the head as the boat rolled over, was drowned. Captain Branscombe’s body was later recovered and buried at Cape Wickham. You can see his grave at Victoria Cove. 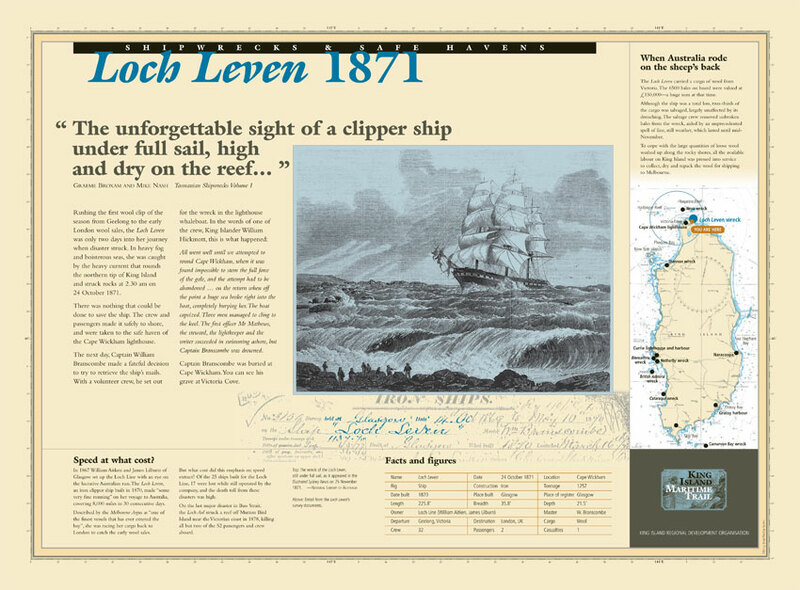 Loch Leven, O.N. 63,759, was an iron full-rigged ship of 1257/1200 grt/net, 225.8 x 35.8 x 21.5ft., built by Lawrie of Glasgow, Scotland, in 1870, and was registered at Glasgow in the name of Glasgow Shipping Company (“The Loch Line”). The wreck of the Loch Leven, still under full sail, as it appeared in the illustrated Sydney News on 25th November, 1871. – NATIONAL LIBRARY OF AUSTRALIA.